﻿ Text to Speech Software (2019) for Windows 10, 7, 8 free download. Text to Speech Software for "Text to Speech"
With Text to Speech Software, your PC can read every text aloud. 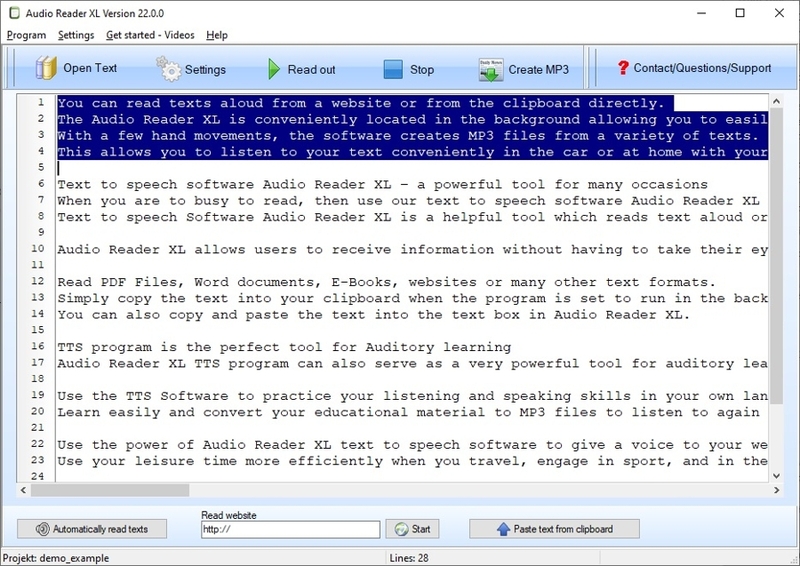 The Text to Speech Software (TTS) transforms your windows computer into a text-reading machine. Allowing your pc to read out loud was never easier. Just copy a text into the Text to Speech Software and your computer will start to read it out loud. In contrast to other read-aloud programs the Text to Speech Reader doesn’t sounds like a robot. The voices are very clear and comfortable. You can even choose the voice you like the most. Various text and document types are supported by the Text to Speech Reader. The Text to Speech Software can not only read word documents. The Text Reader also supports .pdf, .txt or .epub files. It´s even possible now to read .rtf and .html documents. You can download Text to Speech Software right here. Text to Speech Software - free download here! Your Text Reader for PC can now easily read text out loud. Now it's very easy to read text aloud with your computer! Just mark a text and copy it to the Text Reader tool. Your pc can immediately read aloud Text in Windows. Maybe you know about other Text Reader Software's, but our Text Reader is no comparison. Instead of working with robot voices, the Text Reader reads every text loudly and clearly. Whether you would like a male voice or a female voice, it is no problem. You can select from several voice options. You can just choose it and start. 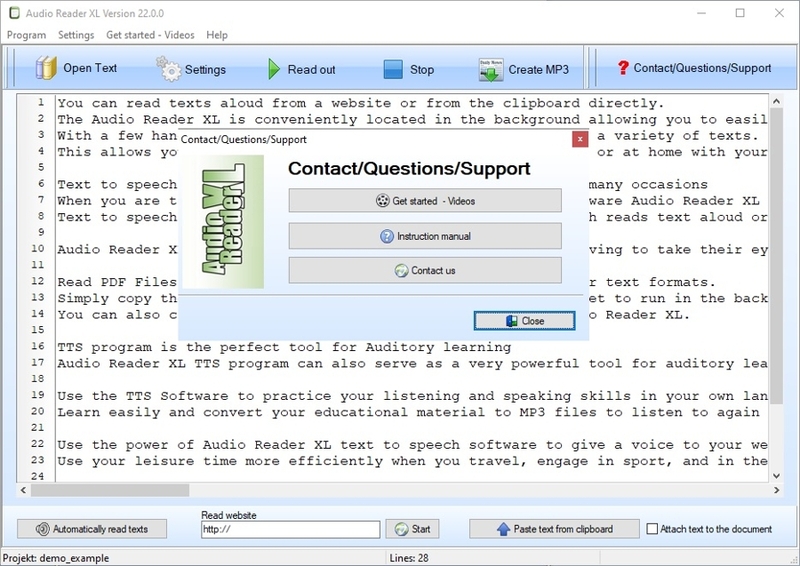 The Text Reader tool for PC reads aloud word documents, pdf documents and txt files. The software also supports epub, rtf or html text. You can copy and paste a text, let your computer read it out loud and continually let the Text Reader run in Windows´ background. That means, every time you copy a text to clipboard, TTS will read it out loud automatically. This method works for all supported document types. Let your PC read all your texts and you can just lean back and listen. Do you want to experience all the possibilities the Text to Speech Reader offers? Just check it out and download Text Reader for free! 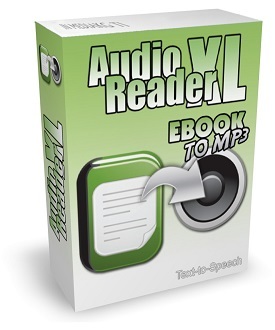 Audio Reader enables you to convert Text to Voice. Now you can convert every text to spoken voice on your pc. With Audio Reader it’s so easy, even a child can do it. You just copy a paragraph, a word, or a whole text to the tool and it transfers text to spoken word. So you can just lean back and listen to your texts instead of reading it on screen. In Audio Reader, you can even choose the reading voice. This Text to Voice Reader supports Word documents, text documents, and epub files, as well as html and rtf. You can download the tool right here. In addition to copying and pasting text and leaving it to your PC to read it out loud, the Text to Voice Reader is also able to run in Windows´ background. With this function, the software is activated every time you change the clipboard. The content of the clipboard will be spoken automatically. If you have many texts and documents on your computer, you can let the Text to Voice Reader read it out loud. You don´t need to read all the information by yourself anymore. Now, Audio Reader reads it and you just listen to. Just try it and convince yourself. You can download audio reader for free right now. 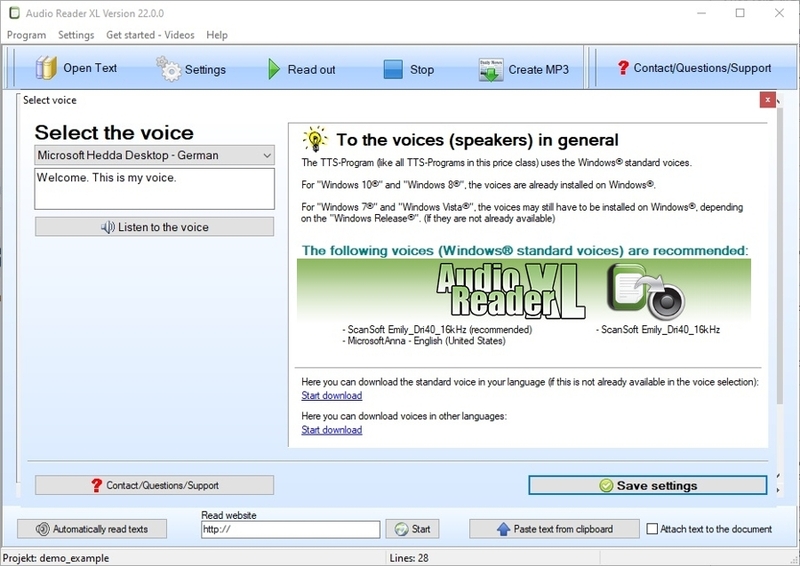 Now it's very easy to let your pc read aloud - with the Text to Speech Software for Windows! Text to Speech Software transforms your PC to a reading station. You can choose every text you like and let your PC read it out loud. No matter if it’s a business letter, a datasheet, or a bill; every text can be converted into audio. Reading a lot of text on your screen will make your eyes tired. 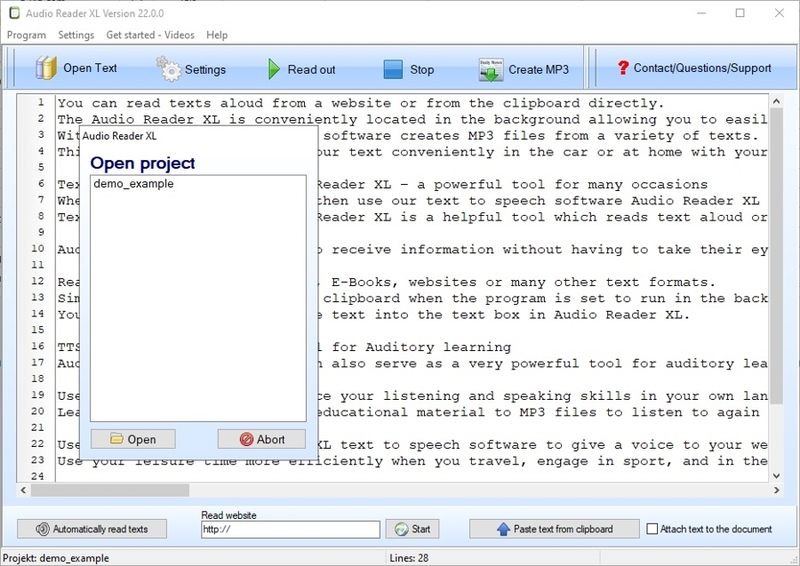 The Voice aloud Reader with Text to MP3 function solves your problem and allows your computer to read them to you. So, sit back, relax, and listen. You can download the Text to Speech Software with Natural Voices right here. The download is free! The Text to Speech Software supports all the common DRM-free document formats e.g. pdf, word, pub, and html. It doesn’t matter in which file type a text is saved. You can just load it into the Text to Speech Reader and your computer will read aloud. Maybe you already know other programs which read aloud in Windows, but this tool is very easy to use and have a natural sounding voice. The reason is simple: Our Text to Voice tool comes with clear voices instead of a monotone robot voice. Your PC reads your document out loud and you will think it´s a human speaking. The voice is loud and clear and you can understand every single word perfectly. Get the application as a free download now. The Text to Voice Reader allows you to convert text into voice. With the Text to Voice Reader, you can convert every text on your pc into voice: no matter if it’s a word document, pdf file, or an epub document. The Text to Voice Reader supports all common text files. You just copy a text or a single paragraph to Text to Voice Reader and your pc will read it out loud for you. You no longer need to read ebooks on screen because the Text to Speech Reader does it. Now check it out - you can download the tool for free! If you have a lot of good texts saved on your hard drive and want to listen to instead of reading, you only need to use Text to Speech Reader. The tool utilizes clear voices so that you can understand every single word exactly. There are no robot voices as used in other Text to Voice Readers. You can also run the tool in Windows background. In background mode, text will be automatically read out loud as the clipboard changes. You only need to cut or copy a paragraph, a word or even a whole text to activate the read function. Let the Text to Speech Reader read out website text, text files or Word documents for you. See for yourself: It was never so easy as it is with Text to Speech Reader. Download it for free now! With Text to Speech Software for Windows 10 you can easily transform text into spoken word. Are you tired of reading long texts on your computer screen? You can now use the Text to Speech Software for PC for reading text from books to your speakers or headphones. Just start the Text to Speech Reader and load your texts into the Text2Speech application. 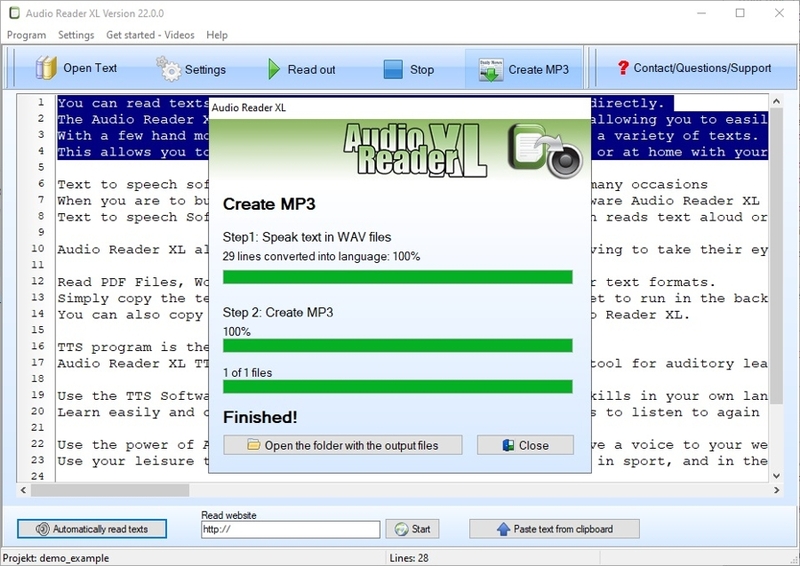 The Text Reader supports word documents, pdf, epub, as well as txt and rtf formats. You can use the Text to Speech Reader for school, work or university. Every time you need to convert a digital text into spoken language, the Text Reader is your friend. Instead of robot voices, you will hear clear voices which allow you understand every single word. You have a choice of several different voices. You haven’t even tried it yet? Now it’s your turn - Download Text to Voice Reader for free right here! Other Text to Voice Programs only provide a robot voice - speaking so fast that no one can understand a word. This Text Reader is different. Firstly, you can choose the voice that is most comfortable for you. Secondly, you can activate reading pauses. This allows you to understand every word with a voice which is nearly as clear as a human voice. Thirdly, it’s even possible to run Text to Speech Software in the Windows background. Are you ready for the Text Reader revolution? It’s just one click away - Download it free here! This good Text to Speech Software free download enables you to let your pc read text for you. With Text to Speech Software free download your pc can read text for you converting it into audio signals. Instead of reading texts manually on your PC screen, your computer will play text as audio. You just choose a text and load it into the software. The Text to Speech Software for PC will read it out for you immediately. Is Text Reader with clear voices and a comfortable user interface still a dream for you? Then we will make your dream come true and provide you the good Text Reader for read aloud text and convert Text to MP3. Feel free to download it now. Text to Speech Software converts text documents content into spoken word. With Text to Voice tool your PC gets a reading system that can read out every text, as you like. Just listen and let your computer read Word documents, pdf files or epub documents for you. You can use it for learning, working, in school or in university. With the easy to use Text to Speech Software for PC you can learn vocabulary or work through long and complex scientific essays. Do you think good Text Reader software is too expensive? We don’t think so - download it here for free! Now it’s very easy and comfortable to convert Text to MP3 in Windows. All you need is your PC and Text to MP3. Just convert your text content from word, pdf, txt or epub to mp3 now. This enables you to use the easy Text to Speech Software without your PC. With Text to MP3 you can have your favorite texts in mp3 audio. Do you have a lot of ebooks you´d like to have in an audio book format? Now you can create your own audio books out of written text with Text to MP3. All you need is Text to Speech Software and your computer. You can burn your texts as mp3 to an audio CD or copy it on usb stick. This way you can listen to your favorite texts on your mp3 CD player. Imagine learning vocabulary while driving your car or listening to an interesting book while doing sports. Perhaps you take notes while listening to the original text as you write down keywords. With the Text to MP3 converter, it´s all possible. You want to convert Text to MP3 the easy way? Then just download the tool Text to MP3 now. 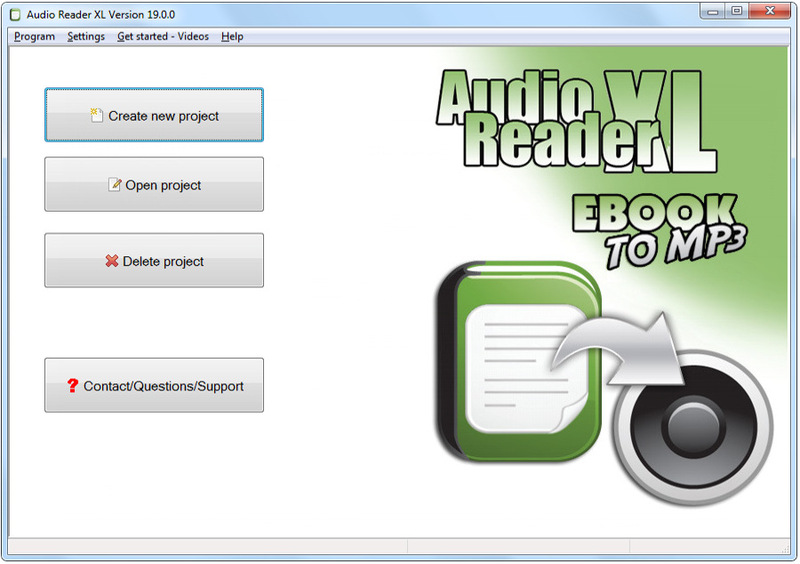 The download of Audio Reader XL is for free!